Website design new home construction companies | Since 2011 when John Froehler contacted VISIONEFX to redesign their website. 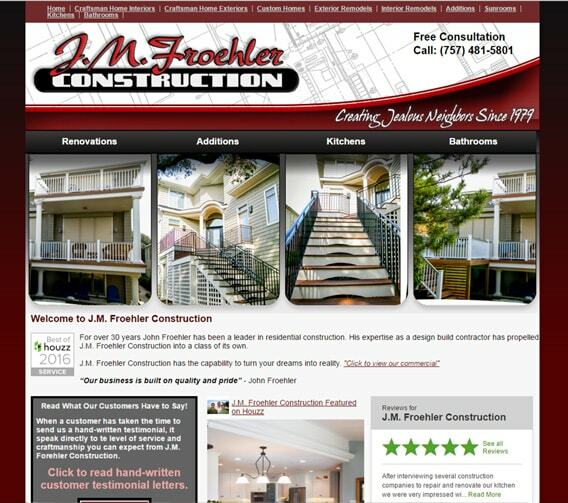 VISIONEFX has designed multiple websites for Mr. Froehler’ various building businesses. We help Virginia beachbuilder.com to maintain a Google 1st page placement for searches related to ‘Home remodeling Virginia Beach’ and many other search terms. This is the 3rd redesign for John Frohler and company since becoming a VISIONEFX client many years ago. When searching Web design Virginia Beach – Web design Virginia businesses look no further than the web design experts at VISIONEFX.